When Investor Awareness began working on behalf of this biotechnology company, the stock was trading around $1.25. Over the next three month period, IA began introducing Ritter’s Management at highly productive meetings to retail stockbrokers, portfolio managers, buy/sell-side analysts, and institutional investors in Chicago, New York, Boston, and Philadelphia. We helped Ritter successfully tell the story of its potential. The stock reached $3.75 and daily average volume increased from 40,000 shares to an average of over 180,000 (in the initial three months). Effective IR campaigns expand the awareness of public companies, build name recognition, and encourage greater stock participation. If you seek additional perspective about how we can help you achieve those objectives, we invite you to contact any of these individuals, who have first-hand experience with the value of services that Investor Awareness provides. Investor Awareness, Inc. was recently brought on to assist in generating awareness on behalf of a new entity that had gone public via a self-registration. Over a 90-day period, Investor Awareness, Inc. played an integral role in bringing enough shareholders to meet the requirements for the Company to successfully up list to the NASDAQ (April 17, 2015). The stock was @1.50 when we started. Today the stock trades above $8.00. 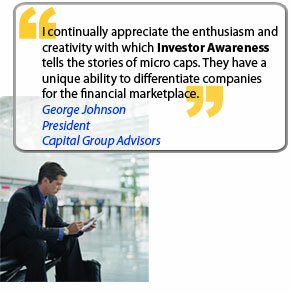 When Investor Awareness began working on behalf InVivo in June, 2011 on an ongoing investor relations road show program, the stock was trading at $0.65. InVivo Therapeutics then burst onto the scene with its potential cure for paralysis and as we introduced the Company in markets throughout the country, the share price went from well under the dollar mark to $3.00. The stock eventually began to trade at $5.00. The company hired Investor Awareness when it was trading for $0.80 on the OTC BB. During our IR Program, Female Health Company began to see an increase in volume, and a greater stock price. The stock traded over $4.00 and eventually hit $9.00 on the NASDAQ. When Investor Awareness began working on behalf of this 3-D medical imaging company, the stock was trading at $1.60. Over the next year, IA began introducing the company on a road show project and the stock went to as high as $10.00.